I was tremendously honored to be selected as the 14th President of Louisiana Tech University by the University of Louisiana System Board. I deeply appreciate each one who offered encouragement and support to Kathy, me, and our family during this process. We have been overwhelmed by all of the positive encouragement that we have received from friends at the university, in the community, across the region, and from the greater Tech Family. Your strong support has inspired us to work even more fervently to continue the advancement of Louisiana Tech as a great institution that serves the citizens of Louisiana and brings exceptional value to all of its stakeholders. We are blessed to have inherited an institution that has been developed through visionary leadership, by deeply committed faculty and staff, and with the support of an intensely loyal group of alumni and friends. Louisiana Tech’s success has always been measured by the success of its students, and we have a long record of graduates who have emerged from the Halls of the Red and Blue to be exceptional leaders in their professions and major contributors to society. Our students will continue to be our first priority, and we will always strive to provide them with an education that is second to none. Kathy and I look forward to serving our institution in this new capacity. 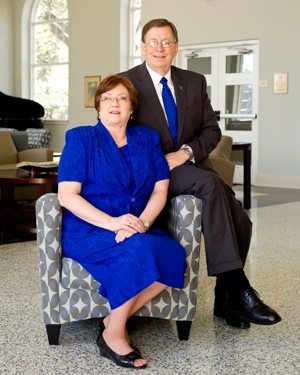 We are most grateful to Dan and Linda Reneau for their exceptional dedication and service to Louisiana Tech University. They have been tremendous friends and mentors to Kathy and me. We hope to share the same level of enthusiasm and hospitality with you that they have blessed all of us with over the past three decades. We look forward to meeting with you as individuals and as groups in the coming months as we get to know our Tech Family even better, and we send our wishes to you and yours for a blessed holiday season. Thank you all for giving us this opportunity.